Last week, Los Angeles-based Sense360 raised $2.75M in a funding round, to go towards its development of a platform to help developers pull together information and make sense of all the data coming from your mobile phone. Sense360's founder is Eli Portnoy, who took his last company, ThinkNear, from accelerator to funding in only fourteen months. We caught up with Eli to learn about his new startup. Tell us about your new company? Eli Portnoy: About three months ago, I left ThinkNear, and started a new company, Sense360, to take a lot of the learning from ThinkNear on how location impact mobile, and apply that to anything on your phone. We're looking for data that location tells you, and combines that into a story, using sensors such as accelerometers, gyros, and ambient light. Phones today have anywhere from eleven to fourteen different sensors, and all of them help tell an interesting story. When you combine that data from all those sensors togther, it becomes very interesting, and you can create a very personalized experience to engage users. We're doing all the hard work to make that happen, by pulling that sensor data and making it accessible to developers. Why would a developer need your software if those sensors are already there? Eli Portnoy: Developers have a big problem. They're spending an immense amount of money today generating downloads. They're giving money to Facebook, Twitter, and others to help get downloads. However, every one of those apps has the same issue, which is that downloads alone don't translate into active users. There's a massive dropoff from when a user downloads and app and when they use it. There has been this myth that once someone downloads an app, that app is on everyone's phone, so that every day they will use the app. The reality is, there are so many apps on their phone, most apps end up in no man's land. They're never used. If app developers can make their experience more personal, and more contextual, users would use them more. But, doing so is really hard. There's an opportunity to use all of the stuff on your phone, taking that sensor data and turning that into insights and engagement, in a privacy friendly way, and help solve this problem. What platforms will this work on? Eli Portnoy: We're not launching yet, so we're not ready to talk about that level of specificity. Ultimately, though, I think it's very hard to play in mobile if you don't work across all platforms. Eli Portnoy: It was an amazing experience since we started ThinkNear four years ago. When we first started talking about using location as one of the key targeting parameters for mobile advertising budgets, we were really mocked. It wasn't something most people thought would happen. However, we found out that location really matters, and that consumers who are in different contexts use their phone differently. That's what's unique about mobile phones, you can understand where people are, and you can infer all sorts of cool things from that, and deliver better ads. It's amazing to see how the market has taken to that, and how big location is now used in the advertising market. Two things happened subsequent to that. One, is ThinkNear grew really, really big. It was really phenomenal. However, you need a leader who is excited about a big company. I figured out I really like early stage companies, figuring out new markets, and building products. I really wanted to get back into that, and realized that was my calling. That's why I started the new company. The second big thing, as we were thinking about location, is that as the market has continued to involve, Apple, Android, and other handset manufacturers are really adding more and more new sensors, and that there is a massive opportunity for app developers to harness that. You can use the sensors in your phone to tell if it's in your pocket, or out of your pocket, if you're indoors or outdoors, running, or cycling, or in a car. All of these things and all these different situations are really relevant to app developers, and can enable them to build really cool experiences. When you start thinking about that, with what you are able to do with those sensors, there's a lot of opportunity here. How did you manage to get ThinkNear so quickly from founding to exit? Eli Portnoy: It was a bunch of things. We really worked tirelessly, and we did not stop. I think that's part of the natural pressure of starting a company, raising money for the first time, and living in LA, which is an expensive market. You have got to make things happen. We were spending sixteen, eighteen, twenty hour days in the office. I was sleeping in the office all the time, and we really plowed through things. We probably spent the equivalent of three years of time, instead of just the eighteen months it took. The second thing, is I think we were just lucky with the timing. Location-based advertising was just becoming possible, and the infrastructure we needed was just there. That helped a tremendous amount. There was a market out there when we built our product, and we could go out and start selling it, customers were ready and receptive, and that helped quite a bit. The third thing, is I also think we got lucky. There is no way, going into it, that we anticipated we'd be able to build a company and get to pretty significant revenue and an acquisition in that short of time. The biggest reason was we just got lucky, and were in the right place at the right time. What did you take out of the experience at an accelerator, and would you do that again? 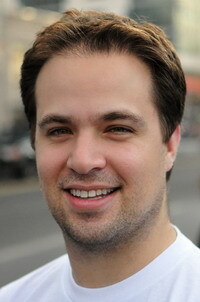 Eli Portnoy: We started as part of TechStars in New York, and that was really foundational for us. It was a really important part of how we got that acquisition really quickly. That said, this time we 're not participating in an accelerator. One, is the primary value an accelerator gives you is access to mentors and investors. We have that access now. As a first time founder, that's incredibly helpful and valuable. The second time around, we have that access, and have a network.